Yikes! Thanksgiving is in ONE week! Are you in panic mode yet? Well, today, I have the perfect idea for a hostess gift if you are heading out to family and friends for the holiday. I am going to tell you all about it below and am even going to be giving away TWO of them just because I love the idea of this gift SO MUCH. 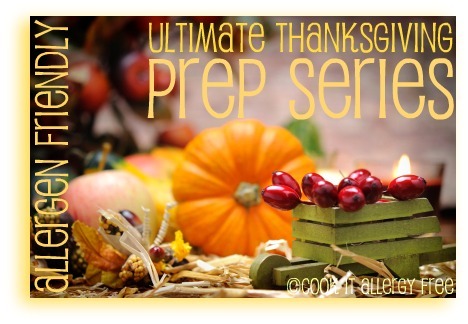 But first, just in case you are cooking the big meal, I wanted to share my go-to game-plan, menu, recipes, and shopping list from my Allergy-Friendly Thanksgiving Series. Cranberry Citrus Cider Sauce AND Green Bean and Shallot Salad with Champagne Vinaigrette. Gluten-Free Cornbread Recipe to use in the stuffing and Crock Pot Mashed Potatoes. Gluten Free Cornbread/Bread Stuffing With Apples, Sausage, Pine Nuts and a secret ingredient that you will NOT want to leave out. Toffee Pecan Caramel Apple Streusel(Gluten-free and Egg-free already, but simple to make Dairy-free and Nut-free too) and Crustless Pumpkin Streusel Pie. 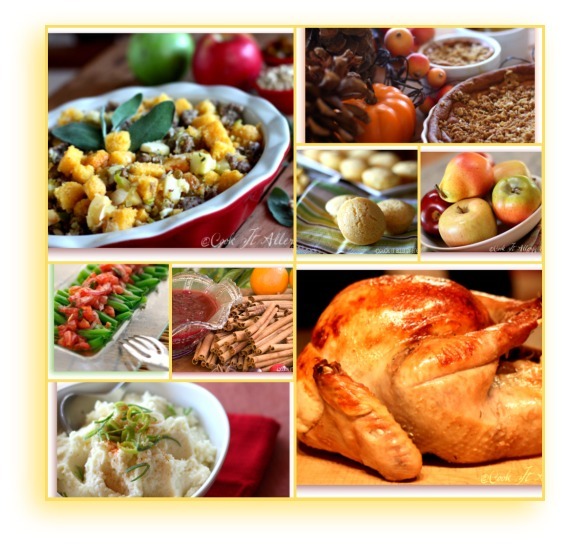 If you are hosting the big feast this year, the above list will make your Allergy-Friendly Thanksgiving so much easier. It has everything you need, from the recipes and the shopping list, to even a step-by-step game plan to keep you organized and get you through the day without going crazy. And in case you are not hosting, but perhaps bringing a dish along with you, you can easily pick from one of the recipes above to bring along and know that you will have an allergy-safe dish for you and your family to eat. You can also bring along this absolutely perfect hostess gift with you this season to pass out to your wonderful hosts of the holidays. The 2013 Cookbook Desk Calendar! 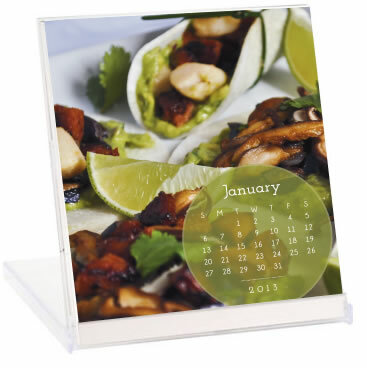 Her one-of-a-kind 2013 Cookbook Desk Calendar is a stunning desk calendar that has individual cards for each month beautifully displaying the calendar, recipe, and a gorgeous full-color photograph of the meal. The calendar itself is based on her own philosophy of easy, healthy, gluten-free living with a simple way to also cook dairy-free, vegetarian, vegan, and Paleo meals all at the same time without having to cook five different meals at one time. AND… each calendar comes in its own gift/shipping box to make your gift-giving really simple this year. Gorgeous color photos of each dish with easy-to follow recipes on the back. All gluten-free and dairy-free recipes with optional Vegetarian, Vegan, and Paleo directions for each recipe to fit any diet! BONUS! Secret access code for a hidden page full of insider tips, tools, resources & 28 additional recipes on The WHOLE Gang website. I recently received my calendar and am completely in love with it. I have it sitting right on my counter and have already made four of the different recipes from it! I love how the recipes are laid out and how she provides options to completely tailor the recipes to whatever your dietary needs may be. And…you may just be one of two lucky winners to receive your own calendar. I am giving away a calendar to two different winners. To enter to win one of your own 2013 Cookbook Desk Calendars, just simply do One, Two, or all Three of the following. Just leave A SEPARATE COMMENT for each thing that you do so that you can earn an entry for each. 1. Tell me what intrigues you about this calendar! 2. Follow Cook It Allergy Free and/or The Whole Gang on Facebook, or tell me if you already do. 3. Share this post with your friends on Pinterest, Twitter, Facebook or other social media and leave an additional comment saying you did so. Help spread the word about this great new cookbook calendar! The contest will end on Wednesday, November 21st at 9.am PST. The winners will be announced then. You must be at least 18 years old to enter. Want to learn the secret code to unlock the mystery of the calender! love the pictures with the recipe and the various options for cooking, i.e. Paleo, Vegan, Vegetarian. I already follow and subscribe on Facebook. Found it by accident and as someone who is trying to change my way of eating have found this PERFECT. What intrigues me about the calendar is that my daughter just started eating gluten free, and I want to find amazing recipes to make meal times amazing! I have “liked” Cook it Allergy Free on FB. I’m really interested in the GFDF recipes! I had gotten down gluten free eating and then had to go dairy free too. So I still occasionally struggle with meal ideas. I like both on FB. Following you on Facebook ! I am intrigued about the recipes on this calendar… but especially about the Hidden Page ! I follow you on Facebook the Cook it Allergy free page. I follow you on the Whole gang Facebook page. I am intrigued by the hidden pages and all of the recipes. Love the fruit pics – food pics on the calendar – did not see the recipes – a bonus! I am struggling at times to be totally gluten free. I have had many stomach issues including reflux, hiatal hernia and ulcers. Going back and forth with my gastroentologist who continuously keeps telling me I must fiber up, fiber up …more and more. I keep telling him I feel more ill when I try to follow his suggested diet for me. I shared this on Facebook! Hope I win! I love the idea that this calendar can just be propped up on my kitchen island – I think I’d use it more that way! what intrigues me is how that much great info goes into that adorable little stand! My husband and I are newly diagnosed gluten intolerant, my daughter the same plus dairy allergy, my niece just diagnosed with Celiacs! its been an interesting year learning what all this means and I can use any help I can get! Hi! I follow you both on Facebook and this is my first Thanksgiving where I am cooking the entire meal! Thank you for this opportunity to win this great calendar. The additional links and recipes are intriguing. Happy Thanksgiving and yes, I am hosting it ! I love the idea of this calendar because I think it will encourage me to try new recipes and get me out of my rut of making and eating the same things. I follow you and the Whole Gang on Facebook. What a fun giveaway! I love the idea of a recipe calendar! I follow both you and Diane on facebook. I liked Cook it Allergy free on Facebook. Have to let you know I’ve spent the last couple hours looking at recipes, you now have a loyal follower! licked too soon ,. . . I would love your 2013 calendar cook book. I think it would help wow my family every day with all the cooking tips. We follow mostly a Paleo diet and the calendar would be a great source of recipes.Hope I’m a lucky winner!